If you are searching for built-up roofing repair, maintenance, replacement or installation near Phoenix, Mesa, or surrounding cities, our built-up roofing company can help! Right Way Roofing is here to help repair leaky roofs, repair built-up roofs, replace built-up roofs beyond repair and install new built-up roofing systems. Built-up roofing is made up of 3 or more layers of roofing materials: gravel, hot tar, and ballast which is made from river stone that makes the roofing waterproof. 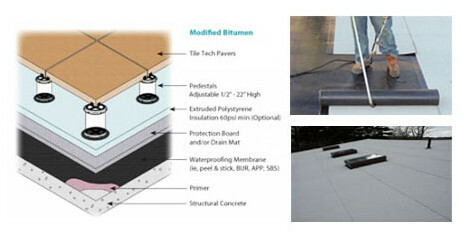 BUR roofing is being fabricated using increasingly advanced techniques and materials. Originally BUR roofing was made from only tar paper. Pros: Built-up roofing the least costly roofing option and with gravel it is also fire resistant. Cons: With the gravel the weight of the roof might require additional reinforcement of your roof to provide the required support. When installed there is a strong odor and can be a little messy, so it is not a highly recommended roofing system for homes that are currently being lived in. 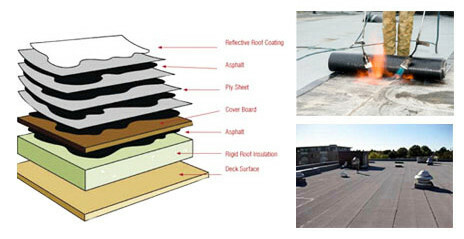 Modified Bitumen Roofing is a single ply roofing system which comes in rolls. The system is similar to water and ice resistant shielding with additional minerals added to the surface which help minimize the wear and tear on the surface of the roofing. Pros: The light colored mineral surface helps reflect the heat from the sun away from your home which can translate into lower energy bills. Cost is average among roofing materials and it doesn’t take long for professional roofers to apply. Cons: The application of this roofing system many times involves torch-down application, which is the application of fire to adhere the roofing, so it is not recommended for occupied homes. This roofing is also not as durable as rubber membrane roofing. Rubber Membrane Roofs have an inner tube like construction which is very weather resistant to damage from sunlight or storms. 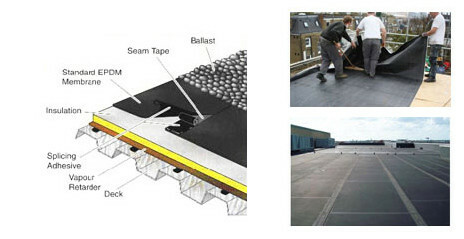 The roofing surface is tough and long lasting due to the durable properties of ethylene propylene diene monomer (EPDM) of which this roofing is made from. Pros: This roofing is great for being a long lasting, durable, and weather resistant roofing material. Professional roofers can install this roofing type quickly. The material is light weight and is especially for the durable against the elements. When or if repairs are needed they are easy and inexpensive to fix. Cons: Of the BUR roofing types this is the most costly. Most of these roofs are black which absorbs heat and heats up homes. Incorporating a second lighter colored coat which reflects sunlight and heat away from your home adds up to 30% to the cost of this material. It is more expensive than it’s counterparts. How Much Does A Built Up Roof Cost? The average cost of an installed new Built-Up Roof is $4.72 per sq. ft. Installed new Built-Up Roofs ranged from $4.00 to $5.55 per sq. ft. for the US in 2019 according to RemodelingExpense. The average cost of a new Built-Up Roof replacement is $4.54 per sq. ft. New Built-Up Roof replacements ranged from $3.86 to $5.66 per sq. ft. for the US in 2019 according to Roofcalc. The average cost of Built-Up Roof repair is $7.00 per sq. ft. Built-Up Roof repair ranged from $6.00 to $9.00 per sq. ft. for the US in 2019 according to Roofcalc. If your Built-Up Roof is suffering from alligatoring, blisters or ridges, we offer a full range of Built-Up Roofing Repair services. If your Built-Up Roof is between 10-15 years old or damaged beyond repair, we offer a complete range of Built-Up Roofing replacement services. If you want all the advantages and durability of a new Built-Up Roof, we offer full Built-Up Roofing installation services. We take every precaution necessary to protect your property during the roofing process and you will find that our crews do a great job of cleaning up the work area each day. Contact us for any Roof Repairs or installations in Phoenix or Mesa, AZ! Free Built Up Roof Repair, Replacement & Installation Estimates! It is quick and easy to schedule your Built-Up Roof installation, replacement or repair services with Right Way Roofing. Our repairs last longer than the competition and offer every one of our valued customers the biggest bang for their buck! We care about our neighbors in and do it only one way, the right way! For more information about Built-Up Roof installation, replacement or repair services please give us a call or click the “request a free quote” button above.